Now entering her tenth season with the club, Executive Director and 18’s Assistant Coach Lexi Patton has helped to develop some of the D.C. metropolitan area’s most outstanding volleyball athletes. 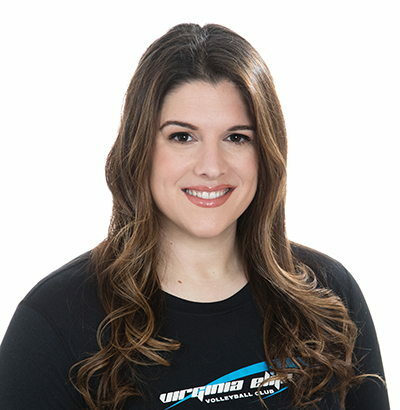 Her dedication has led Virginia Elite to national recognition as both an athletic powerhouse and frontrunner in club culture amongst volleyball clubs across the nation. Patton played for Motor City Volleyball Club and Marian High School in her hometown of Detroit, Michigan. While at Marian, she coached in various recreational youth leagues, and later went on to a two-year stint as an assistant varsity coach at McLean High School. She has received countless accolades with Virginia Elite, and has also led the club to various JVA honors, including the Member Club of the Month and Above and Beyond Awards. Patton now consults with other volleyball clubs about performance and organizational improvements. She recently spoke and presented at the American Volleyball Coaches Association about technology integration in club volleyball. Patton earned a B.A. in Political Science and a Masters in Organizational Performance Improvement from George Washington University. She now resides in Reston, Virginia and works as an Associate Feasibility Strategist for PPD.